Your inquiry is important to us. Please fill out the form, call or email us to get the most up-to-date version of the SDS sheet you are looking for. FORMULA-8 is engineered as a shear-sensitive, aqueous, PTFE thixotropic paste that sheets into PTFE strings when torqued. It is an irreversible process that seals over the entire thread length which means fine threads in instrumentation systems are completely sealed. 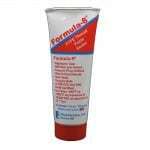 Replaces PTFE tape and corrects challenges associated with tape. Will not cold flow over time, and will not jam check valves or pumps. Won’t deteriorate from -400°F to +500°F. It is stable in pressures up to 10,000 psi and in vacuum-3 torr. No curing time, allowing systems to be put back into service immediately. Wets aggressively to threads and cannot be accidentally dislodged, making it especially useful in those hard-to-reach places. Oxygen tested by The German Federal Institute for Materials Testing (BAM) and ASTM G72-82 and ASTM G86 (NASA). Non-toxic, non-hazardous, odorless, and chemically inert.